Mike Mandel Hypnosis The Hypnotic World Epicener. Best in Class Hypnosis Recordings and Hypnosis Training from a Six Time Award Winning Hypnotist. Listen to Mike Mandel’s brief explanation of this incredible system. For iPhone users the embedded audio player doesn’t show up so simply click here to play the intro. 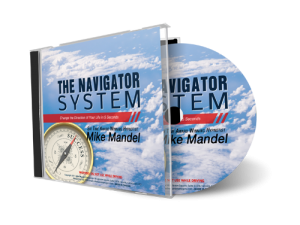 The Navigator System is a system of unconscious change created by Mike Mandel. Most of you already know Mandel because of his reputation as an amazing hypnotist and hypnotherapist, or from his work as an instructor of Ericksonian Hypnosis. But the Navigator is entirely new, completely original and quite simply – amazing. Have you ever been in a car, boat, or other vehicle? Of course you have. But have you ever just let the vehicle go wherever it wanted without paying any attention to its direction? I’m talking about the equivalent of getting in a boat and just letting the wind and currents take you wherever they are going. Have you ever done that? Of course not – that’s crazy. You’d never get to where you wanted to go. And that would be fine if you had no idea where you want to go. The Navigator System isn’t for people who don’t know what they want. It’s for people who DO know what they want but find themselves moving in the wrong direction. Metaphorically, your life is heading in a direction. You control that direction. The only difference is that this control is typically unconscious rather than conscious. Consider driving on an open highway for a moment. The road is clear, the sky is sunny, and you know exactly where you are heading. You can let your mind wander, yet you’re still driving perfectly. Your hands and arms make a constant series of tiny corrections and adjustments of the steering wheel to keep you on track. We are navigating our entire life in that same unconscious manner, except it’s a bit more complicated than steering a car down a highway. Your brain is constantly making unconscious decisions on your behalf. It does its best job to get you where it thinks you want to go. But have you ever actually TOLD your unconscious mind where you want to go? Probably not. Mike Mandel created The Navigator System as a way to use hypnosis to quite literally install a navigator within your unconscious mind. The Navigator can then accept commands from your conscious mind (simple commands that you speak to yourself), and it will execute those commands. When we say “install”, we’re not talking about computer software that you run on your PC or Mac. The installation comes in the form of an audio track, using hypnosis. The Navigator System comes in the form of a MP3 audio track + PDF documents that you’ll need to use the system..
First, you’ll listen to the first audio track, which will take you about 30 minutes. In this track, Mike Mandel explains to you exactly what the system will do, how to use it, how it was created, and why it works so well. Second, you must run “The Forgiveness Protocol”. This drops your excess baggage overboard so you can have a clean slate on which to work. This only takes a few minutes. Third, you install The Navigator using the hypnosis track that Mike Mandel has created specifically to assist you in doing this. This takes about 20 minutes. Fourth, you will create a “map of your world”. Instead of mapping the oceans, mountains and cities, you’ll be creating a map of what you want MORE of and what you want LESS of. These instructions are a series of default protocols for your unconscious to run whenever you haven’t given it a more specific command. At this point The Navigator System is completely installed and ready to use. Your fifth and final step is an ongoing process called “Using your Compass”. This is where you apply the system in everyday life. These are 5 second “bursts” that Mike talks about allowing you to access your unconscious to serve as your loyal navigator, to take you where you want to go. You’ll consciously give yourself commands which trigger the unconscious Navigator System to do its work – to guide you through the journey of life. Mike Mandel has also included what is known as the “Sundown” process, explained as “Learning from the day’s journey”. He’ll show you how to spend 3 minutes each evening to refine your navigator by reviewing elements of your day that you liked or disliked. This process is a great way to speed up the benefits that you’ll get from the system. If you forget to do this, that’s fine, but it’s absolutely a good habit to get into at night. Simply put, The Navigator System is an elegant way to improve your life. Mike Mandel has combined skills from Hypnosis, NLP, EFT, BSFF and numerous other therapies in order to develop the model for The Navigator System. As with all digitally downloaded products sold at MikeMandelHypnosis.com we aim for full satisfaction. If you are not completely satisfied with your purchase, for any reason, simply contact us to ask for a refund. We will honour refunds with no questions asked for up to 60 days. There is a reason why we hardly ever get any refund requests. Mike Mandel only puts out a few products and he dedicates an enormous amount of effort to make sure they are going to help people. 60-day money no-questions asked refund policy. We stand behind what we sell. If you purchase a digital product and are not satisfied, for any reason, just ask us for a prompt, courteous refund within 60 days. There's nothing for you to return, so all the risk is on us. What payment methods are accepted? We accept most credit cards including Visa, Mastercard and American Express. We also accept PayPal for a limited number of products. How do I download my purchase? After payment, you are given a password to login to our members area. Your products will appear inside of your personal product library. They can be downloaded or streamed directly from the Internet on any device. Is my payment information secure? Yes, payments use best-in-class secure connections. It's actually more secure than ordering by phone because no human sees your detailed financial information. What if I'm not happy with my purchase? We insist that you either ARE happy, or you ask for your money back. See our 60-day unconditional refund policy information above this FAQ section. New to Mike Mandel Hypnosis? Check out our awesome free podcast.